Lockport, “one of the creations of the Erie Canal” [from H.G. Spafford, A Gazetteer of the State of New York, 1824], is dominated in its history and the present time by the “Flight of Five” – a series of five locks which were designed and built to lift boats over the Niagara Escarpment. 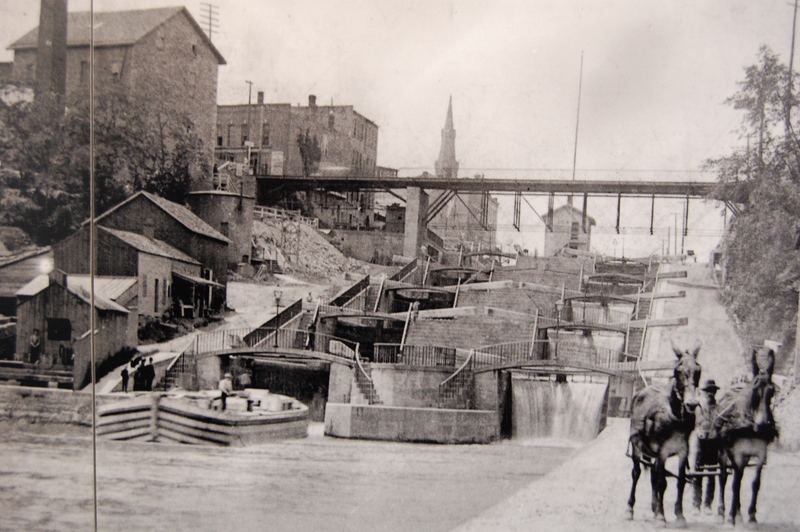 The construction of the “Flight” and the “Deep Cut” just west of the locks were two of the many wonders of engineering that made the original Erie Canal possible. During the canal’s first expansion, the original flight of five was replaced by two sets of enlarged, side-by-side masonry locks able to accommodate boats of Lois McClure’s size and larger. One set of these five combined locks is still preserved next to the two modern locks, E 34 and E35, which are in service today. Approaching Lockport from the east is like stepping back in time. Historic buildings speak to the wealth and commerce that the early canal generated, lift bridges rise vertically to allow you to pass under and the New York State Canal Corporations operations center and dry dock reminds you that the system is still vibrant, alive and being maintained by a new generation of caretakers. We stopped at Upson Park just west of the Canal Corps facility where we were greeted by a band and speeches of welcome and appreciation. That evening and all the next day the music and visitors continued as the Lois McClure was presented as one of Lockport’s “Old Home Week” events. The docking site at Upson Park was the perfect place to greet the public and also to explore Lockport’s canal and industrial history. 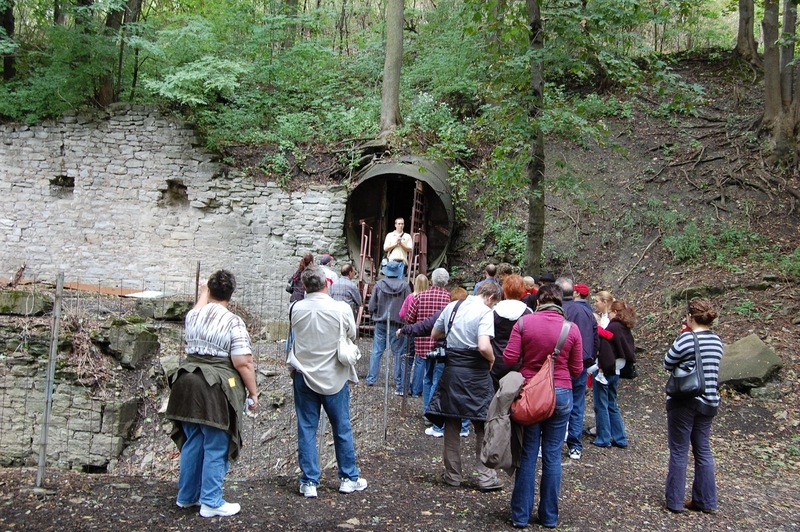 The mountainside on the north-side of the canal was filled with archaeological remnants of the industrial buildings that once utilized the abundant power of falling water. Today, guided tours and even a boat ride into the inner workings of the facility offer a view at the many ways water was harnessed to create power. On top of Flight of Five is the Erie Canal Discovery Center, run by Douglas Farley (who was the organizer behind our visit to Lockport and did a fantastic job), a modern visitor’s center, museum shop and wonderful multi-media presentation about the origins of Lockport and the canal engineers and creative engineering that made it famous. On my walk back to the schooner I took the path past the old “Flight of Five” and the new canal locks where I remembered that there was an old power station building which had been converted into a historical presentation. As I made my way through the collection of objects, photographs and canal memorabilia I was drawn to an object I had never seen before.It was a long pole with an iron strap wrapped around the blunt end and I was immediately excited. Having been a devoted reader and re-reader of Captain Theodore Bartley’s Journals, I have been struck by how often he indicates that he is poling his boat. He even describes making a pole, using it to travel from place to place within a harbor or up some creek that a tug can’t go. But Captain Bartley fails to provide any detailed information about what the pole looked like. He must have thought anybody interested enough to read his journal would certainly know what a pole was. 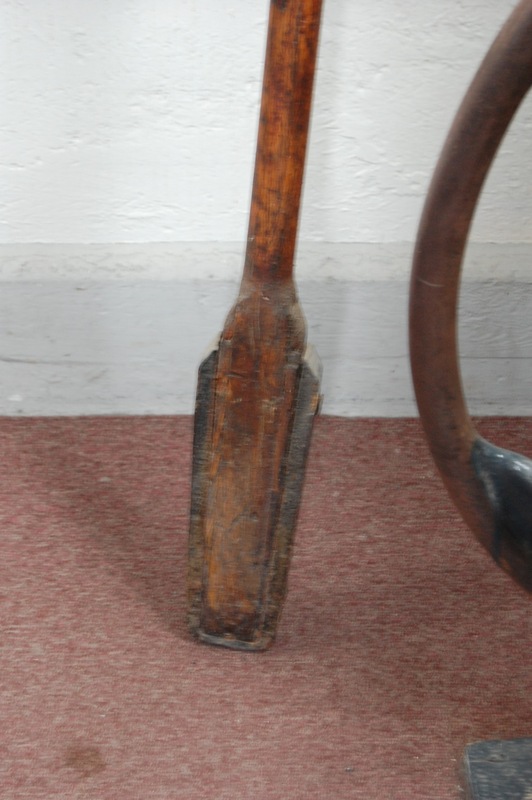 I have enclosed a photo of the “pole” like object and would appreciate any thoughts or suggestions about whether this might be the elusive pole that all canaler’s used for short distance moving or something else. Lockport was our westernmost point of travel on this 2010 World Canals Tour and as we dramatically turned the Lois McClure to the east, we were now on our way to the World Canals Conference in Rochester.